Tonight's dinner was Sea Bass baked in salt in the Dutch Oven, cooked outside on the fire, so dinner was cooked for free, you would think all that salt would make the fish salty but it doesn't, the salt when baked becomes solidified around the fish and when cooked you have to break the salt open to free up your dinner, The Dutch Oven is great for cooking outdoors it is a big cast iron pot with a lid, we were given it for Christmas a few years ago but never really got round to using it until this year now we love it and have now bought a tripod to suspend it over a fire, proper outdoor campfire cooking. 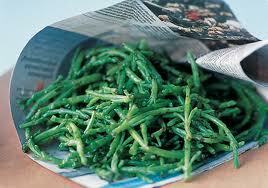 Along with the fish we had Samphire fire cooked in garlic and butter. Samphire is a plant that grows in the salt marshes along the coast, also know as poor mans asparagus, it is a seasonal plant and has a bit of a salty asparagus taste. Now the summer has finally arrived everything is coming on great in the garden, picked the first cucumbers and the first of the tomatoes have ripened at last, we have planted out some Black Kale and tomorrow we will get some leeks put into the ground, we have Beetroot ready to be picked and the Sweetcorn is coming on great, the peppers and chillies are setting there fruit, we have got more peas to get sown as well for an autumn harvest, tonight we are setting the Crayfish trap baiting it with the fish heads last Sunday grandson manged to haul in a bucketful without a trap that we had for dinner so fingers crossed we will have some for dinner tomorrow.